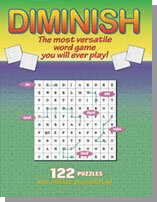 A unique word search puzzle with no clues, Diminish is appropriate for students of all ages and abilities. You'll be amazed at its versatility. See the Diminish Website.